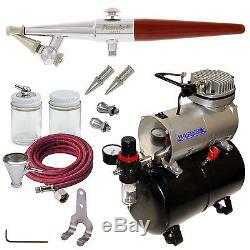 Paasche H-SET Series Single-Action Siphon Feed Airbrush Kit with a Master TC-20T Air Compressor with Air Tank & Air Hose. The World's Most Popular Airbrush - recommended for all skill levels. Sturdy and flexible, the H airbrush is dependable and adaptable for practically any hobby or artistic use. The Model H has a Tapered Socket for securing Bottle or Cup. This H Airbrush Set includes all three cap sizes1, 3 and 5. High Performance Master TC-20T Airbrush Compressor with Air Tank and air filter / pressure regulator and an airbrush holder for 2 airbrushes. The H Airbrush is Excellent for multiple use: T-Shirt Airbrushing, Taxidermy, Leather Airbrushing, Models, Trains, RC Cars, Ceramics, Graphic Arts, Body Art Tattoos, Cake Decorating, Chip or Ding Repair, and More! 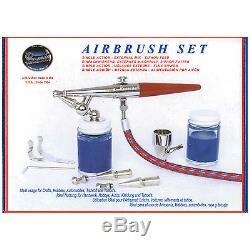 Complete Paasche H-SET Airbrush System Includes. 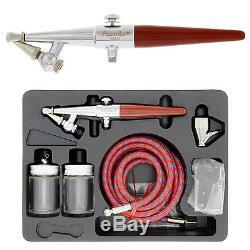 The Paasche H Airbrush Set includes. H #1 Single-Action Siphon Feed External Mix Airbrush. #3 and #5 Air cap, Needle, Nozzle Sets. 6 Foot Braided Air Hose. 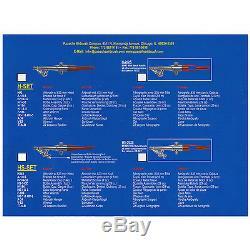 PAASCHE'S 22 Airbrush Lessons Booklet & Parts Sheet. The H AIRBRUSH is Excellent for multiple use: T-Shirt Airbrushing, Taxidermy, Leather Airbrushing, Models, Trains, RC Cars, Ceramics, Graphic Arts, Body Art Tattoos, Cake Decorating, Chip or Ding Repair, and More! Here's an idea of pattern sizes and which set-ups are best for various fluids. Master Airbrush Model TC-20T Tank Air Compressor Specifications : Type : Single Cylinder Piston Compressor w/Air Tank Power : 1/5 Horse Power Voltage : 110-120V / 60HZ Air Control : Pressure Regulator with Gauge and Water Trap Filter. Precise Air Adjustment : True Diaphragm Pressure Regulator with Gauge and Water Trap Filter that provides precise adjustment of airflow and ensures clean, dry air. Automatic On/Off Shutoff : Preset for automatic turn off when air tank reaches 60 PSI. Preset for automatic turn on when air tank pressure is below 35 PSI. The reduced running time means there will less motor wear and less heat-related moisture enabling a longer compressor life. Constant Pressure and Zero Pulsation : Air is drawn from the large air storage tank providing you a constant regulated pressure. There's zero pulsation because air is drawn from the tank which eliminates any pulsation effect from the pistons. "Air-On-Demand" : Designed to work only when you do, produces air on demand at the your regulated pressure. Thermally Protected : Automatically turns itself off if the unit becomes over heated. Maintenance Free : Oil-less Piston Motor Low Noise : Very Quiet Operation, only 59 db. San Diego, California South Carolina. 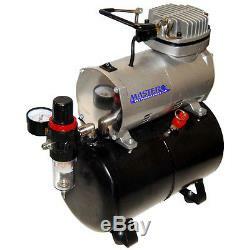 The item "PAASCHE H-SET AIRBRUSH withQuiet AIR COMPRESSOR with TANK" is in sale since Tuesday, December 01, 2015.